For those who enjoy being outdoors, but tend to get a bit chilly, we offer our promotional blankets, printed with your business logo. Whatever you might use one for, it makes sense to buy these affordable embroidered blankets or screen printed blankets in bulk so you can share them with friends, family, customers and employees. Our promotional tote-a-blanket combo is the perfect gift for those employees or clients who regularly attend baseball games and who might need a little warm up in the 9th inning. Stay warm and cozy, whatever the weather may be outside, by wrapping yourself around the Fleece Travel Blanket. 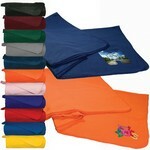 Embroider your company’s logo on the blanket to enhance your brand’s value. 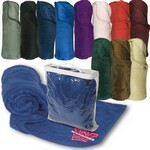 Stay warm and cozy, whatever the weather may be outside, by wrapping yourself around the Fleece Travel Blanket. 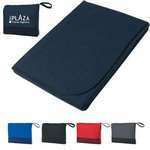 Screen print your company’s logo on the blanket to enhance your brand’s value. Enjoy the game to the fullest and don’t let outside weather conditions mar your viewing experience, when using the Fleece Stadium Blanket. 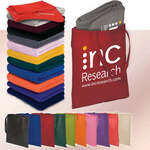 Embroider your business logo on the blanket, for widespread brand recognition. The embroidered Oversize Sherpa Blanket features a hidden zipper seam for easy embroidery. Our laser engraved Oversize Sherpa Blanket is made from faux micro-mink on one side and faux lamb’s wool on the other. Our embroidered Sherpa Blanket is made from faux micro-mink on one side and faux lamb’s wool on the other. This laser engraved Sherpa Blanket features a hidden zipper seam for easy embroidery. Keep yourself warm and cozy wherever you go with the Tote-A-Blanket Combo. 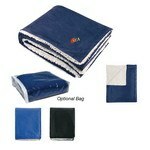 The set combines the Fleece Throw Blanket with the new Econo Non-Woven Tote. The Travel Blanket ensures that you remain warmly wrapped at optimal temperatures, whether you are traveling far or near. 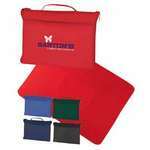 Screen print your company’s logo on the blanket and create a warm impression of your business with potential customers. Get cozy with this Deluxe Plush Blanket and feel the world of comfort. This is a Luxurious 14 oz. Get these fashionable Econo Blanket and color up your lifestyle. The Blanket is made from 200 GSM 100% polyester fleece material. Cuddle under the Sherpa Blanket with your loved ones and feel secure. 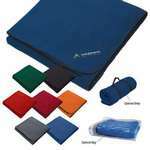 Add your company’s logo on the blanket to multiply your brand’s popularity.